It might be interesting to look and see if there is a direct correlation between the unprecedented length of UE benefits today and the job losses since 2007. What makes today's extended job losses so much different than previous recessions? announced that it will be shuttering all 78 of its kids and men’s stores. It started when you implied that it couldn't get much higher. I pointed out to when it was higher. and it was a meaningless point because 20 years ago doesnt equate to today.. What was the results then? Did we extend unemployment for YEARS? Its putting the $$ into the hands of the unemployed which is needed to boost demand and the economy. Yes it has a cost, but that $$ is not techniclaly coming out of the economy. Bull crap.. Where do you think its coming from? People are needed to serve whether or not we are at war. The actual numbers don't go up that much. Aside from the fact it doesn't have the same impact as putting $$ in the hands of the unemployed. So you pretend that the 100,000 troops at war would still be needed without the war? Seriously, thats your argument? Thats like saying we should continue the war to continue to reduce the unemployment. Do you realize that these people normally have real JOBS, that they need to get time off in order to go to war? The $$$ to pay for unemployment is not coming out of anyone's hands. People don't have less $$$ in their hands because its being used to pay for someone else's unemployment. Yes they do.. where on gods earth do you think the $100B comes from if not from someone elses hand? Explain the cycle to me to magically come up with $100B from no where because I want to study this new math so I can get $100B all for myself without taking it from others.. Why stop there.. I want you to tell me how to get $1T without taking it from others.. Lets put Gates and Buffet to shame!!! That boom started before the cutting was put in place. A balance budget occurred due to revenues that went through the roof. Revenues have remained consistant to the federal government for the most part regardless of the tax rate. I said over and over again. If you start with Dec 01 and count to Dec 07. That is basically the job changes from Dec 31st 2001 to Dec 31st 2007. You could do the same by starting with Jan 02 and ending with Jan 08, which would mean the changes from Jan 31st 2002 to Jan 31st 2008. Both of those are six full years, 72 months. If you use that, you have a little over 7 million jobs. What you are doing is counting Jan 31st 2002 to Dec 31st 2007, 5 years and 11 months (71 months). You are doing this so you can include seasonal job gains, but not include seasonal job losses. The tax cut credits didnt kick in until people started doing their tax returns.. Why would you count from Dec 01 when the tax cuts to encourage job growth didnt take place until 2003? Stop twisting the numbers to suit your own agenda because the BLS says you are wrong.. that 10,200,000 jobs were created!! You disagree, go argue with the BLS.. They are already doing more than fine. The portions under the $250,000 mark won't see an increase, so a small business sitting just above the $250,000 mark would see little or no increase. You would need to get close to the $1 million of taxable income for even the increase to account for one salary. So if they will see little or no increase then why the objection? I dont give a rats patute if it takes close to $1M to equate to 1 salary, if tax cuts are good, then they are good for all.. otherwise you are just playing political Democratic bs games..
Now look what happens every single January. That is what you aren't including, since you are using the end of Jan as your starting baseline and the end of Dec as your end point. You are not including all the Jan losses that occur due to the end seasonal employment, but are including the seasonal job gains. The reason you never hear about this is when the BLS releases its figures every month, they do so on a seasonal adjusted basis. Fine, what January would you like to add to the equation to result in your phantom 2.7M job losses? You havent answered despite being asked numerous times.. Why not? Because IT DOESNT EXIST.. You are just arguing for the sake of arguing without any point. Well they would still be getting the cut on the bottom $250,000 of their income, its only the portion of the income above that which would see an increase. They would still actually wind up with a larger $ over $ cut compared to what it was pre 2001 than a small business with $150,000 in taxable income. Also again it was to point out that the vast majority of small business's and the vast majority of employees that work for small business's would have never been impacted by this. So what? Again if tax cuts are good for the economy, then its good. You dont get to pick and choose if they are good for person A, but bad for person B. You do not boost demand for jobs by putting money into the unemployed. Even the Obama economic advisor stated this in a book he published in 1999. We dont have unemployment extensions to boost employment, we have unemployment extensions to reduce the harships on society.. Thats not the same.. It wasnt until Democrats need to find reasons to justify their failed policies that we've started hearing the bs that its to boost employment.. I stopped here because previous recessions had similar businesses closing down. Sun TV, Circuit City for example.. This isnt any different than previous ones other than the fact that we are now creating more problems by failed policies where previous ones actually did something about it..
Obamas own economic advisors said in 1999 that this approach wouldnt work.. Now all of a sudden we are to believe it does because its "Obama".. Please.. what universe do you live on where taking money from A to give to B = more money? And those who deliver the bare-bones essentials - where are they on the economic food chain? Higher. More money gets spent on food and essentials. More people in the supply chain will be able to afford more than the basics. Demand will pick up. The middle class will feel a bit more secure, spend a bit more cash. People with money tucked away will tuck away extra money as well. People with nothing will spend what they get. That's the bigger boost. No its not because you FIRST have to take it away from person A to give to person B.. If person A doesnt have it, they cant be spending it.. You are simply moving who is doing the spending..
How many of these things are actually made in the US?????? Sounds like a good way to decrease demand and get more people fired. *RIGHT here : All the stores that have CLOSED and all the people that have lost their jobs. Don't have to tell me, I see it everyday on the Randall Rd corridor. More expty shops everyday. 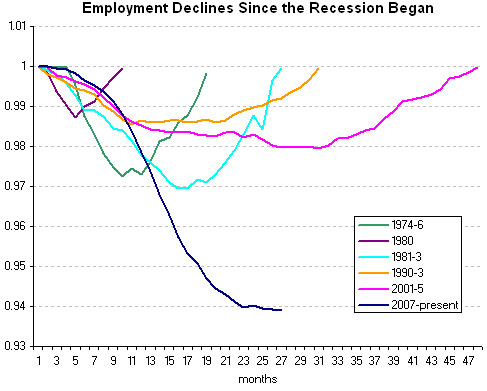 The point of the chart showing the current job losses to previous recessions. What is different today than yesterday? ONE thing that is different is the 2+ years of UE benefits, which I believe is adding to the jobless picture. There is a bit of truth to this. But if you don’t put money into the unemployed then the drag they put on the economy is far worse. Make work for them to do and pay them for doing that work. That is what is needed. The money spent on unemployment benifits is an economic stimulouse but it doesn't work as such because it isn't replacing the person's lost income it is onely replacing a small part of it. Replace all of it and then some and the economy will grow but you can't do that as why would you work? In Irelad durring the potato famine they didn't give people enough to stay alive when they did make work projects for the poor this was so that they would have to go out and get a job. Well a lot died from starvation. How has the 2+ years of UE benefits helped alleviate the job market? It hasn't...at all. Again, the people collecting UE benefits ARE NOT out there on a spending binge and they won't be in the future. They are just barely hanging on, spending for the necessities and that is all. Why do you continue to ignore that point? The UE CAN'T afford above and beyond the essentials and without that kind of spending from people who can afford it, the job picture is bleak indeed. Rubbish. Truly unbelievable the case you're trying to make. What you're saying is those on UE will boost the economy MORE than people with jobs, with disposable income to spend on luxury, nonessential items. The working poor, the UE, with their spending on basic necessities of life just to survive will impact the economy MORE than people who have money to burn. Just incredible.